This circuit board is from the USB dongle of a Girl Tech IM-ME. [Joby Taffey] took it apart and poked around to learn its secrets. These dongles come along with the pink pager that has become a popular low-cost hacking platform. But we haven’t seen much done with the dongle itself up until now. [Joby] used the OpenBench Logic Sniffer to gain some insight on what’s going on here. The board has two chips on it, a Cypress CY7C63803 USB microcontroller which talks to the computer over USB and also communicates over SPI with a Chipcon CC1110 SoC radio. It looks like reprogramming the Cypress chip is a no-go, so he went to work on the CC1110. 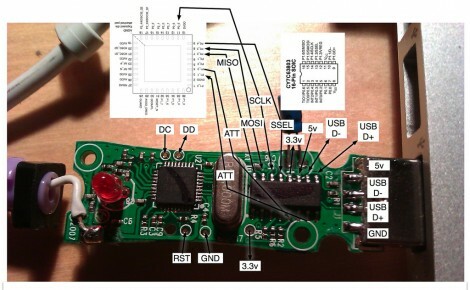 The inter-chip communications data that he acquired by sniffing the SPI lines gave him all he needed to reimplement the protocol using his own firmware. As a proof of concept he to reflashed the CC1110 and can now send and receive arbitrary commands from the dongle. There’s a tiny video after the break showing a script on the computer turning the dongle’s LED on and off.